The spectacular Columbia Gorge is full of Native American petroglyphs. For petroglyph viewing near Maryhill Museum of Art walk the Temani Pesh-wa Trail at Columbia Hills State Park where pictographs and petroglyphs are on display. No reservations are needed to view the dozens of rock art displays and interpretive panels, which are open daily from April-October. With advance reservations, guided tours to viewTsagaglalal (She Who Watches) run at 10 a.m. every Friday and Saturday between April and October. Tsagaglalal is perhaps the most famous petroglyph in the Pacific Northwest. More information is available by calling 509 767-1159. The park also offers camping, boating, fishing, hiking, and rock climbing activities. There are two boat ramps and a small launch fee. Camping sites are on a first come-first serve basis. The park is located on SR14 at milepost 85 about 12 miles west of Maryhill Museum of Art. 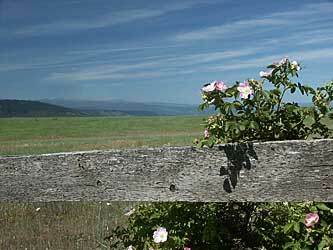 This park has spectacular views of the Columbia Gorge, with hillsides carpeted in spring wildflowers. It is located just off SR14 at milepost 84, about 13 miles west of Maryhill Museum of Art. A 99-acre camping park with 4,700 feet of waterfront on the Columbia River in Klickitat County, WA. This is a full-service park with campsites, RV hook-ups, showers, and rest rooms. No reservations are taken. There is a daily vehicle fee. For more information phone 509 773-5007. 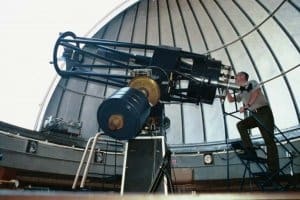 Located on a hilltop North of Goldendale, Washington, this unique facility caters to the general public with programs designed to educate the novice as well as the experienced star gazer. The facility is run by the Washington State Parks Department. Admission to the Goldendale Observatory State Park is via a Discover Pass. You can find out more information by visiting the Washington State Parks website.